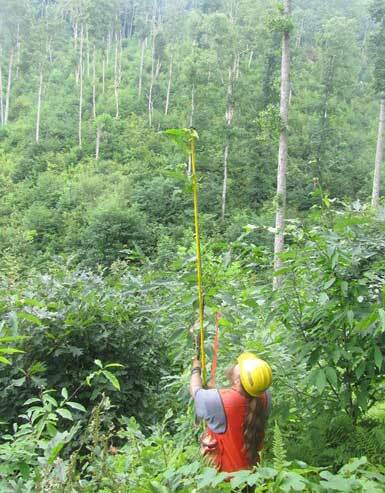 A University of Tennessee research technician measures a chestnut tree planted in 2011. Photo by U.S. Forest Service. Working with others, the U.S. Forest Service may be one step closer to restoring the American chestnut tree to the mountains of western North Carolina. Beginning in 2009, agency researchers and partners planted close to 1,000 potentially blight-resistant American chestnut trees in the Nantahala National Forest in North Carolina, as well as in national forests in Tennessee and Virginia. Two additional plantings were established in Tennessee and Virginia a year later. The goal is to test their resistance to chestnut blight. Since then, more than 80 percent of the American chestnut backcross hybrid saplings planted in the three national forests have survived. Most of the trees are healthy, growing steadily and showing differing levels of resistance so far, which is encouraging for the hopeful people working to return the tree to its native range. As they enter their fifth year, the once-young seedlings have reached an average height of 8 feet and overcome what Forest Service scientist Stacy Clark, Ph. D., calls “planting shock” by developing a strong root system and adapting to their new environment. Clark, a researcher with the agency’s Southern Research station, oversees the project. Before the introduction of the chestnut blight in the early 20th century, American chestnut trees dominated forests of the eastern United States. Known as the “redwood of the East,” the tree often reached towering heights of 150 feet. Experts estimate that at one time, one in every four hardwood trees in the East was an American chestnut. By the 1950s, the blight had killed billions of trees and left the species virtually non-existent. Today, any chestnuts found in the Eastern forests never grow beyond a few feet tall and rarely flower. Chestnut trees have reached a “genetic dead-end” in the United States because of their inability of reproduce. “One level of success is to develop a tree that will survive long enough to naturally pollinate and reproduce,” said Bryan Burhans, president of The American Chestnut Foundation (TACF). Since the early 1980s, TACF has worked to restore the trees to Eastern forests through the development of a blight-resistant backcross hybrid. The foundation has used traditional backcrossing methods to produce a tree that is an American chestnut and blight-resistant Chinese chestnut backcross hybrid. The seedlings are 94 percent American chestnut and carry the gene for blight resistance. Of the American chestnut trees planted in three national forests, half were backcross hybrids and half were native chestnut trees. The trees were planted through a collaborative effort between the Forest Service, TACF and the University of Tennessee. In 2004, the Forest Service signed a Memorandum of Understanding with TACF, designating the Forest Service as the “most favored recipient” of the TACF’s chestnut material, and the resulting seedlings are to be incorporated into management activities on National Forest System lands. The University of Tennessee’s Tree Improvement Program provides the necessary infrastructure for Forest Service scientists to implement nursery and field studies of chestnut material. The Forest Service has played an important role in restoring the American chestnut through funding and expertise, as well as allocating land usage. Burhans says he is optimistic about the future of the American chestnut hybrid, but admits that the trees planted in the three national forests face challenges in the coming years. As the trees continue to mature, their blight-resistance will be put to the test. Meanwhile, Stacy Clark, TACF scientists and others will continue to look for conditions and other useful information that will help to return chestnuts to the East. More than a hundred years ago, American chestnuts thrived in forests of the East. With ongoing refinement of the hybrid trees, collaboration by partners and hope, widespread restoration of the American chestnut may become a reality the next one hundred years. This story was written for the National Forests of North Carolina (NFNC) and originally published on the NFNC website at http://www.fs.usda.gov/detail/nfsnc/home/?cid=STELPRDB5439130 . Read a recent article by Stacy Clark on the reintroduction of American chestnut. For more information, email Stacy Clark at stacyclark@fs.fed.us .